Welcome to the second of three posts on Sixpoint Craft Ales from Brooklyn, NY. I wish I could say that I had more interesting history to throw at you, my ever so faithful reader. However, I covered everything that I feel comfortable posting without an interview with Mr. Shane Welch, one of the brewers, or perhaps the head of PR. And, since you probably come here for the beer reviews I should probably just get right on with it. The Wednesday post is on another of Sixpoint’s year round beers, Bengali Tiger. 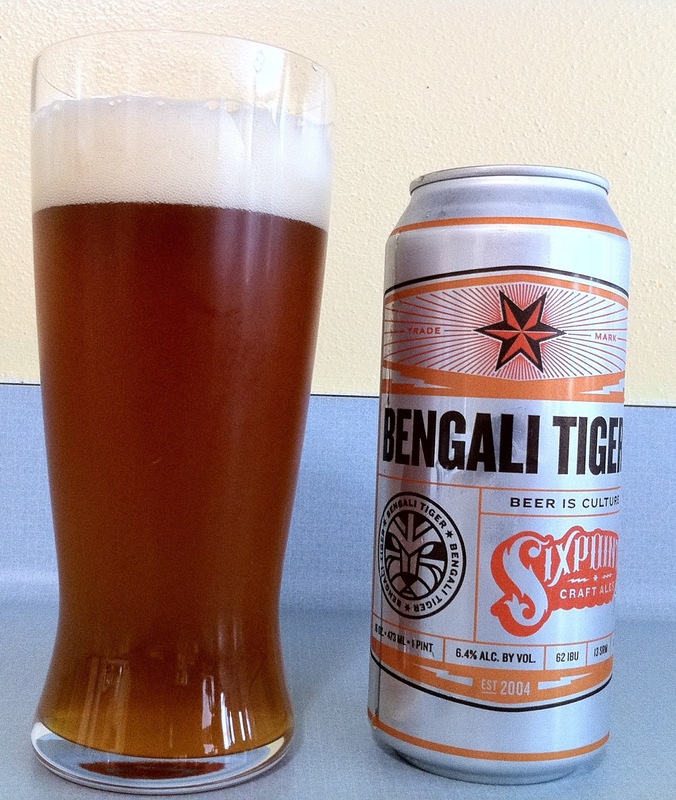 Bengali Tiger is Sixpoint’s take on an IPA, and is in the tradition of East Coast IPAs. I won’t jump into the feud over whether a west coast or east coast IPA is better because quite frankly I enjoy them both. Sometimes I want the nice full bodied and malty east coast version and other times I want the overwhelming bitterness that is popular out in California. If you are interested in the differences and want to hear arguments in support of East vs. West I would highly recommend Googling : East Coast vs. West Coast IPA. You will find many viewpoints on which is superior, but in the end both are great interpretations of the style. On Beeradvocate, Bengali Tiger has a score of 88 with a 99 from the Bros.(the Bros are definitely dead on as usual). Over at ratebeer it has a 94 overall and an 89 for style. What immortal hand or eye. Could frame thy fearful symmetry? The Sixpoint homebrewed IPA interpretation. Blaze orange in color, with an abundance of citrus hop bitterness, and a full pine and grapefruit bouquet in the aroma. … Strides forward with a malty cadence, then leaps with a wave of bitterness. Slashed with a giant paw of citrus, pine, and resin! Note the lacing of stripes around your glass – it is the mark of the Tiger. A citrusy, tropical American IPA. East-coast style - malty & hop-forward, not hop aggressive. Citra, Cascade, Chinook, and Centennial hops. Just the right amount of bitterness with Bengali - very well-balanced. Bengali Tiger pours a hazy deep gold with a very nice, thick, creamy, light tan head with excellent retention and great lacing. I would wager that the haze is hop derived from a generous dry-hop addition. The aromas are piney, earthy and resiny with a generous amount of citrus and bready notes on the back end. The flavor starts malty and earthy, transitioning into citrus and resin hop notes before finishing smooth and creamy with piney hop notes lingering in the background. This is definitely a dangerous beer in that I could easily drink through a 4-pack of cans without realizing it, it is just so unbelievably smooth and drinkable. Bengali Tiger is medium to full bodied with a moderate level of carbonation. This is an excellent beer that you should try if you can find it. I thoroughly enjoyed Righteous and Bengali Tiger confirms that Sixpoint definitely brews excellent beers! That’s all for today! Check back on Friday for a review of Sweet Action!